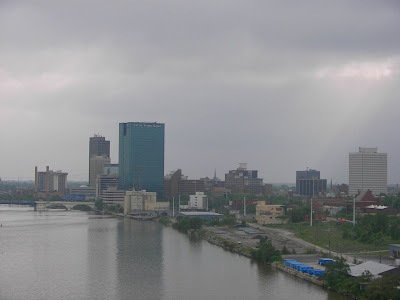 (Toledo, OH) Downtown Toledo looks rather grim in this shot I took the other day from the Veteran's Memorial Skyway. I might try the "glass half full" perspective and mention the single ray of sunlight breaking through the clouds, but my rainy day mood precludes me from seeing beyond the gray skies. But the ray of light is there just the same. Mike is the Veterans Memorial Skyway also known as the Hi-Level? No, the official name of the Hi Level Bridge is the Anthony Wayne Suspension Bridge.